If you expect the best, you need the best! And this nut cracker is simply the best on the market in high yield cracking. Experience results of 200lbs of nuts cracked per hour! Even at with this powerful output, our cracker can be transported in the bed of a pickup truck. Don't limit yourself with a stationary cracker. Even more versatile-- this cracker is designed for pecans, English walnuts, peanuts, almonds and hazelnuts. This sheller is made of industrial grade materials and primed mild steel that can withstand the elements. Quality built in the USA-- made to stand the test of time! Maintenance is simple-- bearings need yearly greasing. This cracker has a 120-volt gear motor that turns a rotor inside of a cage. Cracking is easily and quickly adjusted with a hand jack to accommodate multiple size pecans. Cracker produces a majority of halves based upon pecan freshness, moisture content and fed speed. 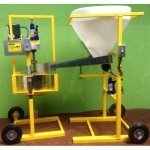 Comes with a 50lb capacity Auto Feeder that feeds the machine consistently. Features safety functions such as overload shut down and GFCI shock protection. Take your cracking to the next level with our industrial cracker. 48" tall by 24" long by 24" wide. 180 (100lb)- 185 (200lb) lbs in weight. Freight delivery (included in price). © 2019 Garden Harvesters, all rights reserved worldwide.